If you've picked up this book, you probably recognize the value of fundamental analysis, but aren't sure you can master it. With Getting Started in Fundamental Analysis as your guide, you'll quickly become familiar with the key concepts and learn how to put them into action in the real world. balance sheet and income statement ratios. the P/E ratio and how to use it. how the combination of fundamental analysis with technical methods creates a powerful strategy. 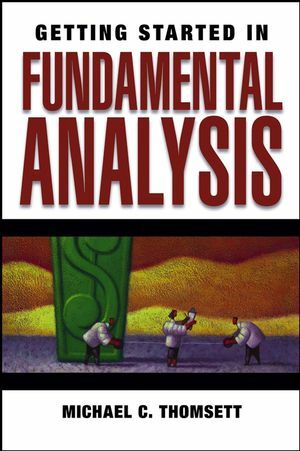 More than an introduction to fundamental analysis, this book will help you use analytical tools in identifying risk levels, making valid and reliable comparisons, and picking stocks for your portfolio so you develop a successful and profitable investment program. Michael C. Thomsett is a financial writer who has written more than sixty books on investing, real estate, business, and management topics. He is the author of several Wiley books, including Getting Started in Rental Income, J.K. Lasser's Real Estate Investing, and six editions of the bestselling Getting Started in Options. Prior to his writing career, Thomsett was a professional accountant and systems consultant. Chapter 3. The Audited Statement – Flawed but Useful. Chapter 4. Finding Financial Information Online: Step-by-Step Explanations. Chapter 10. Using Fundamental—and Technical—Analysis Together.